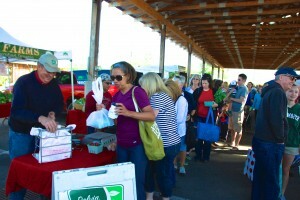 Every Saturday before the Franklin Farmers Market opens, there’s always a crowd gathered at the entrance into the market, waiting eagerly to get in and grab all of their fresh food favorites. 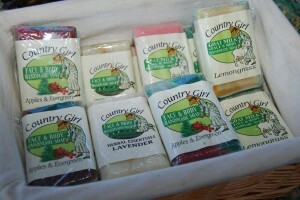 Welcome back Rocky Glade Farm! But this past Saturday, people were not in such a hurry to get into the market because of the sweet sound of violins playing. 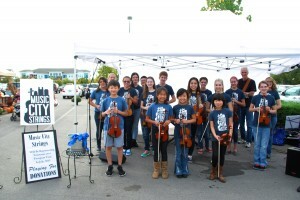 The Music City Strings students were performing at the entrance to the market, playing such favorites as the Tennessee Waltz and Rocky Top. 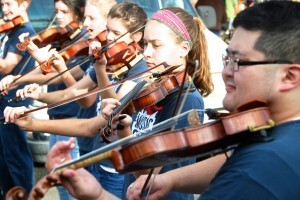 This special group of musicians range in age from pre-school to high school and they’ve played for audiences all over Middle Tennessee. 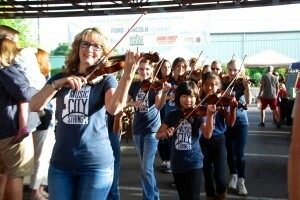 The Music City Strings have now been invited to join a 2015 concert tour in Europe to represent the culture and music of Tennessee. 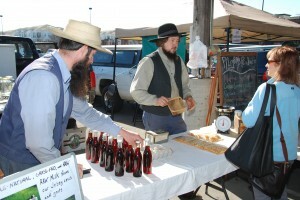 If you missed their performance this past Saturday, mark your calendar for October 25th when they’ll be back at the market. 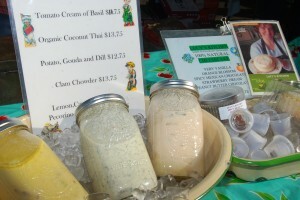 Good food and good music at the Franklin Farmers Market – It’s the perfect combination for a great day. 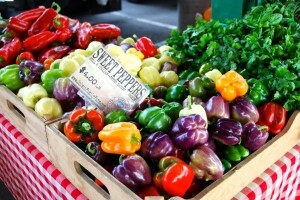 It’s always colorful at the FFM, because of the large amount of fresh, local produce. 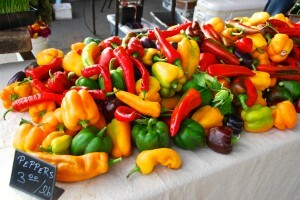 Bright red tomatoes, yellow squash, green peppers, broccoli – the wide variety of vegetables makes for a big rainbow of color. 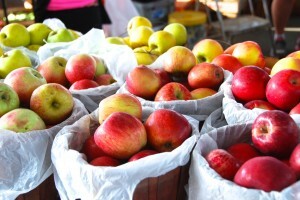 But now, with the beautiful purples, yellows and burgundies of mums along the varying shades of delicious apples, the colors at the market have changed. 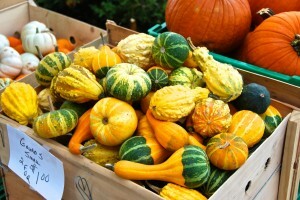 There are gourds with green stripes and star-shaped squash with polka dots. Orange pumpkins can be found all over too. But it’s not just orange pumpkins. Some are white and some are green. 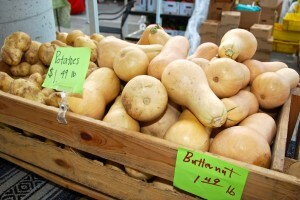 There are pumpkins that look downright warty and others that have stripes. 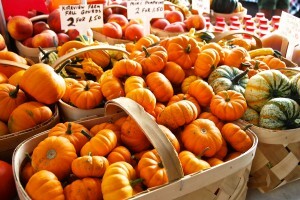 There are pumpkins that you can hold in the palm of your hand and a few that probably weigh more than you do. 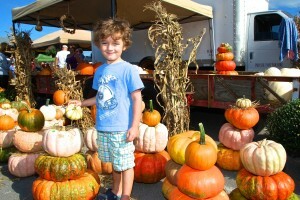 And with those all of those pumpkins, we know that scarecrows are just around the corner. Lots of scarecrows. Every October, the Invasion of the Scarecrows happens and this year’s invasion takes place on October 18th. 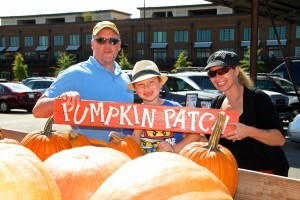 It’s a fun day for the kids, with a special pumpkin patch and the Perfect Pumpkin Painting booth. There’s tricks and treats and funny Halloween face-painting too and the best part is, it’s all free for the kids. 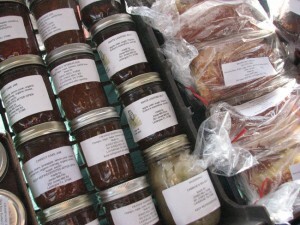 As always, there’s plenty of delicious fresh food from your favorite farmers at the market too. And from big and tall to short and small, there are scarecrows are everywhere. The Invasion of the Scarecrows takes place October 18th! 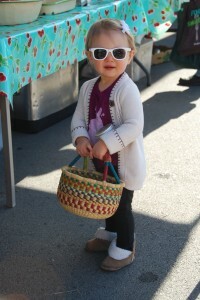 Who and what did the market paparazzi catch on camera this past Saturday at the market? 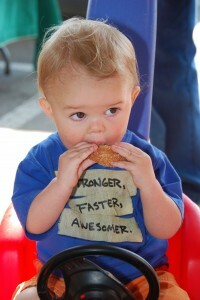 Find out with a look at the FFM photo gallery! 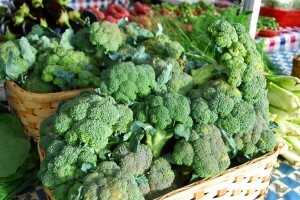 This entry was posted in Market Saturday News and tagged broccoli, Franklin Farmers Market, fresh food, green peppers, local produce, mums, pumpkins, tomatoes, Vegetables, yellow squash on September 29, 2014 . A gourmet farm dinner on the grounds of beautiful Bloomsbury Farm would be a dream come true for connoisseurs of fresh food. Therefore, we’re making that dream a reality. 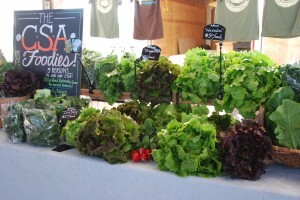 Enjoying fresh sustainably grown food from local farms is a pleasure that deserves to be celebrated. 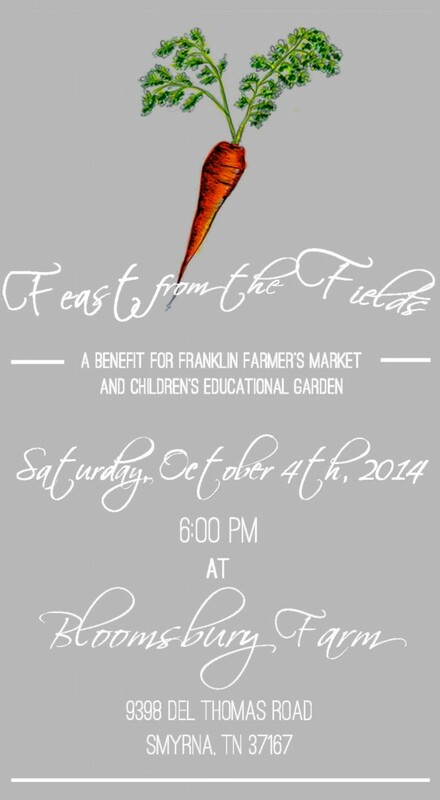 Join us for “Feast from the Fields”, a unique culinary experience featuring delicious food from the farms of Middle Tennessee on October 6th. 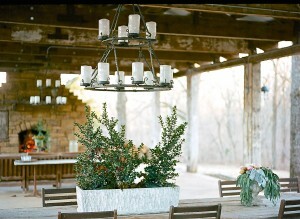 This farm to table dinner will be held at Bloomsbury Farm, one of the most picturesque farms in Tennessee. 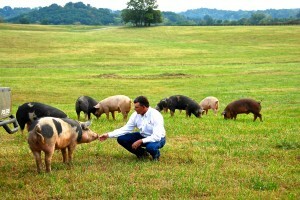 Surrounded by lush meadows and the wooded hills of Rutherford County, Bloomsbury Farm provides the perfect setting to relax and enjoy an abundant gourmet meal with wine pairings. 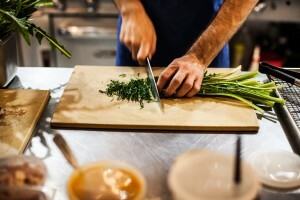 James Beard Award nominee Chef Philip Krajeck of Rolf and Daughters Restaurant will creatively prepare a savory four course meal using only the best ingredients from such farms as Bear Creek Farm and Bloomsbury Farm. The menu of “Feast from the Fields” will showcase the intense appetizing flavor of the fresh food straight from local farms. 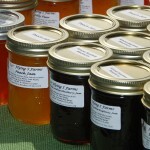 “Feast from the Fields” proceeds will benefit the Franklin Farmers Market and the Franklin Farmers Market Educational Foundation. 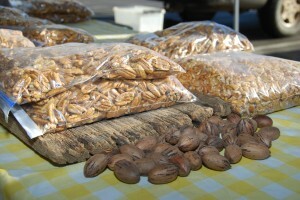 The 501 c 3 organization focuses on educating the public about local agriculture and the significant role that it plays in the economy, environment, health issues and overall aesthetic values of communities. One of the main objectives of the foundation is to teach children about nutrition with an appreciation of food from seed to plate. 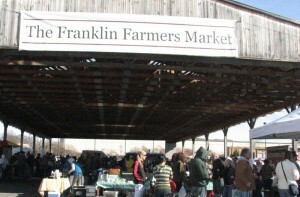 In 2011, the Franklin Farmers Market Educational Foundation formed a partnership with the City of Franklin Parks to establish the Growing Kids Educational Garden. The free garden program gives children hands-on lessons about the good health values of fresh food along with a greater understanding of where food comes from. “Feast from the Fields” farm dinner tickets are sold in advance at the Franklin Farmers Market or by emailing leeann@bearcreekbeef.com. 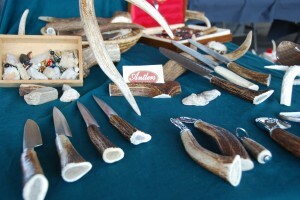 Tickets are $250 per person and include cocktail hour and a four course meal with wine pairings. This entry was posted in Market Saturday News and tagged Bear Creek Farm, Bloomsbury Farm, Chef Philip Krajeck, Farm Dinner, Feast from the Fields, Franklin Farmers Market, fresh food, Growing Kids Educational Garden, James Beard, local farms, Rolf and Daughters on September 4, 2014 . And they’re off! 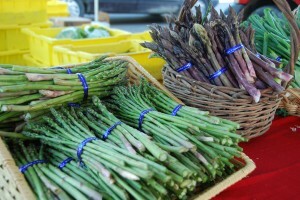 It was just like a race this past Saturday as some of you practically ran through the market to get strawberries, the first asparagus, radishes and other spring goodies. The lines for strawberries were particularly impressive. 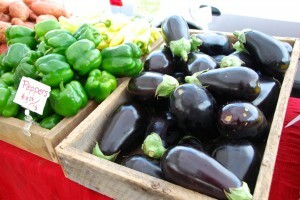 But If you missed out on the ‘berries and new veggies, don’t worry. There should be even more next Saturday. With the warm temperatures and sunshine we had, things are growing a lot faster now. 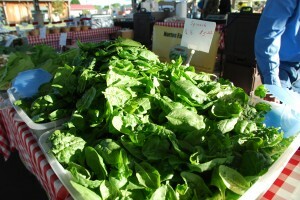 Enough so, that the market will begin its’ summer season next Saturday (May 3rd), giving you an extra hour to find your favorite fresh food. 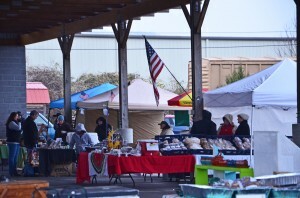 Market hours will switch to 8am – 1pm. 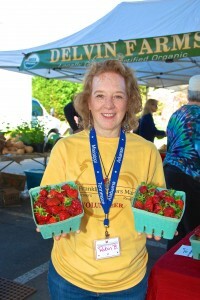 Delvin Farms Strawberries are in! 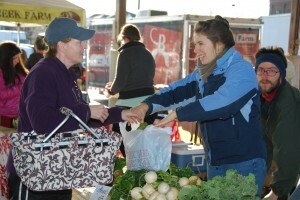 This past Saturday was also Volunteer Day at the market. 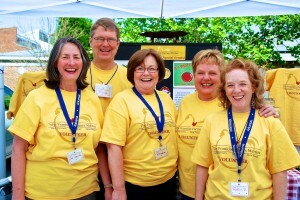 We’ve got a great group of volunteers, but we can always use more to help with special events and market operations overall. A good number of people stopped and signed up to be a member of the FFM volunteer team. 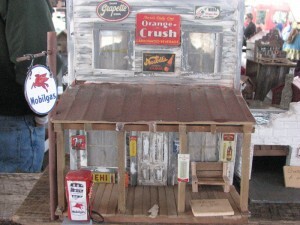 If you missed out, you can become a team member by visiting the Volunteer section of the market website. 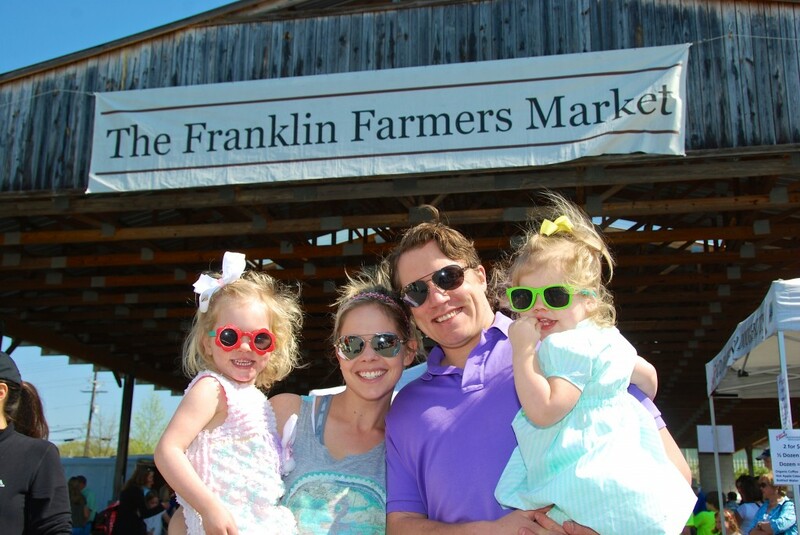 It’s a great chance to become friends with the farmers and vendors, be up close and personal for all of the FFM’s special events and to be styling in a really cool volunteer t-shirt too. Visit our volunteer page to learn more. 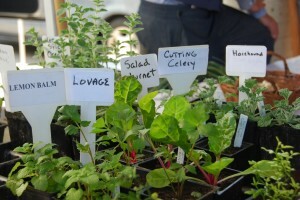 As we said before, days like this past Saturday really put things in the garden into high gear. 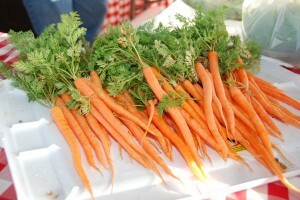 Every weekend through the summer, there’s some newly harvest vegetable coming into market. 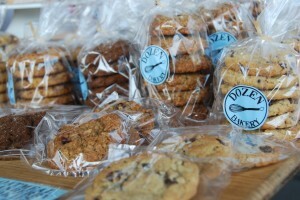 It’s only natural to grab as much as you can to take home and enjoy. But do you know how to take all of those veggies and turn them into the perfect meal? 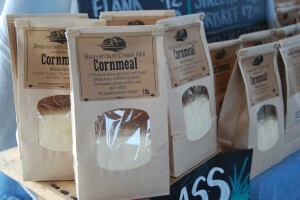 Find out how at the FFM’s Chef Saturday. 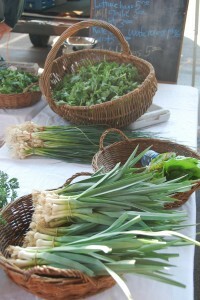 On the first market day of every month, there will be a professional chef at the market to give you more ideas on cooking. 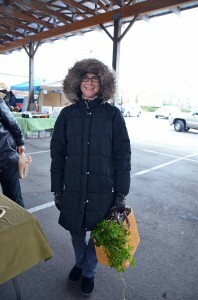 This upcoming Saturday, Chef Cyndi Shalhoub who specializes in delicious healthy organic cooking will be at the market to show you great ways to prepare the perfect meal with the fresh food from the market. 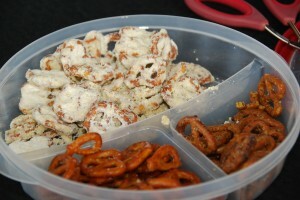 When you get a sample of what she prepares, your taste buds will be doing the happy dance! 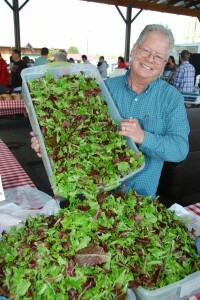 This entry was posted in Market Saturday News and tagged asparagus, Chef Saturday, Cyndi Shalhoub, farmers, fresh food, Fresh Lettuces, strawberries, veggies, volunteer on April 28, 2014 . Allegedly, there is no “perfect” day. 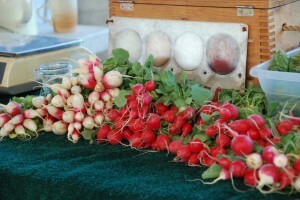 But this past Saturday came pretty close to being one a perfect farmers market day. 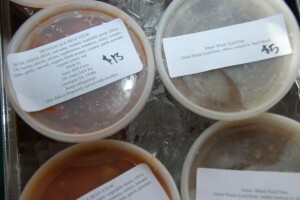 It was a sunny, warm t-shirts and shorts kind of day and there was plenty of good food all around the market. 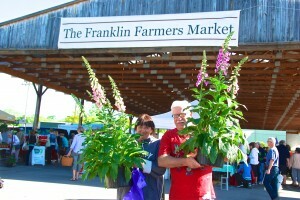 One of the things that make the Franklin Farmers Market a good place to go on any day in the spring is to see what’s new – what’s growing on the farms, what springtime veggies are ready to enjoy. 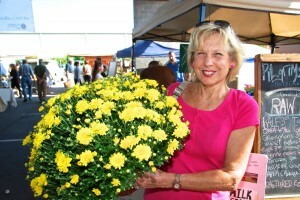 The bright colors of flowers were popping up all over the market, with bedding plants for people to take home and increase that curb appeal. There were the veggie “starter” plants grown by the farmers for those of you that like to do a little back yard gardening. It was a good weekend to grill out too and many of you were getting the best in beef, chicken and pork from our farmers to enjoy. Lots of smiling faces all around as everyone just got outside and enjoyed the day! 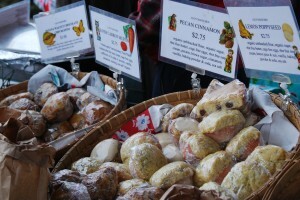 Of course, some of you were kind of pushing the season on Saturday, expecting to find such goodies as corn and tomatoes at the market. After all, you’ve see corn showing up in the produce section of the grocery. 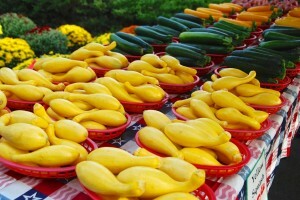 We’re anxious for corn, tomatoes and other summer goodies to be ripe too, but it’s not the time of the year to find those veggies at the market. 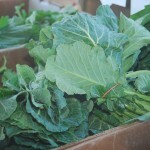 Beaverdam Creek Farm CSA, sign up today for your farm CSA! 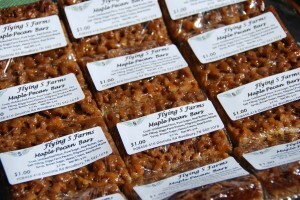 And while the weather plays a big role in when crops are ready to harvest, you can get a good idea of when your favorite fresh food will be at the market by stopping at the FFM’s Info Booth at the front of the market and getting what we call the “cheat sheet”. It’s a handy little chart that gives you an idea of when the peak season is for summer produce in Tennessee. 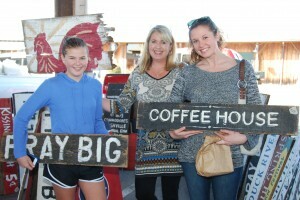 All in all, it was a great Saturday at the market. Lots of smiling faces all around as everyone just got outside and enjoyed day! 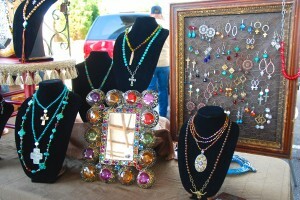 See for yourself with a visit to our market photo gallery. 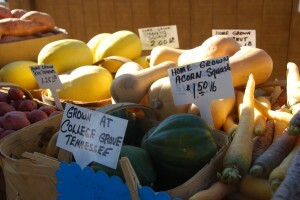 This entry was posted in Market Saturday News and tagged bedding plants, beef, Chicken, corn, crops, farmers, Farmers Market, farms, flowers, Franklin Farmers Market, fresh food, harvest, pork, produce, starter plants, Tennessee, tomatoes, veggies on April 14, 2014 . Isn’t it funny how the weather can affect your mood? Days of cold, cloudy weather can really bring you down, but when that first bright sunshiny day pops up, it’s amazing to see all the happy faces out and about. 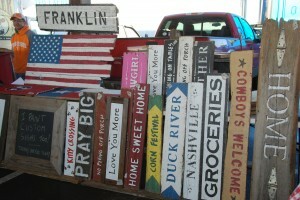 That’s the way it was this past Saturday at the Franklin Farmers Market. 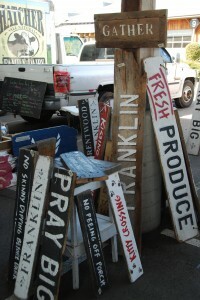 There was a big bunch of people all over the place, talking, smiling and picking up some of the best in fresh food from local farms that you could ever find. 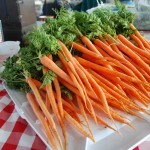 There were vegetables like sweet crunchy carrots and fresh lettuce for salads, along with sweet potatoes and herbs to spice things up a bit. A proud Grandma with her new twin baby girls! 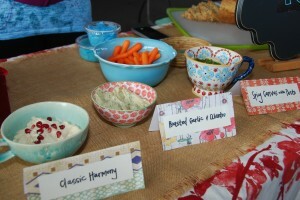 And then there were all types of soups, baked goods and sweets to take home. 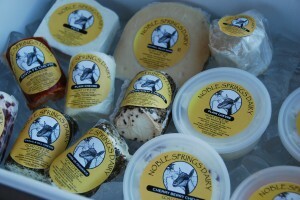 All very delicious, but we’re anxiously waiting for the first real spring veggie to show up. There’s a whole lot of back and forth with the weather in March. It could be freezing cold one day and in the 70’s the next. 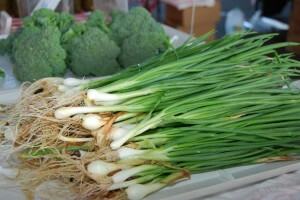 But the official first day of spring is now just 3 days away and very soon, the first of the spring vegetables will be ripe and ready. 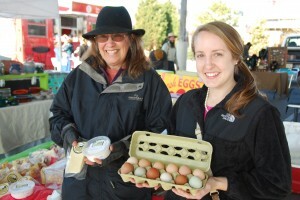 We talked to all of the farmers at the market this past Saturday, asking about their spring crops. 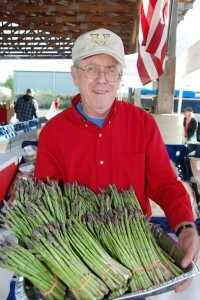 And after doing so, we’re betting that asparagus will be the first spring veggie to make an appearance at the market. 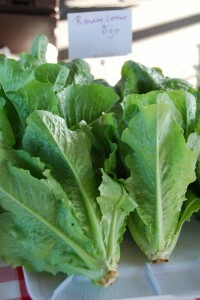 Then again, broccoli or snow peas could surprise us and show up a bit early. But whichever one shows up first, it doesn’t matter. We’re just like you are…. Hungry for spring! Saturday was the perfect day to be outside walking the dog, so we understand why some folks brought their dogs with them to the market. 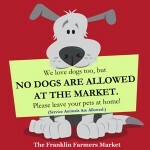 Unfortunately, the Franklin Farmers Market is not the place for the dogs. 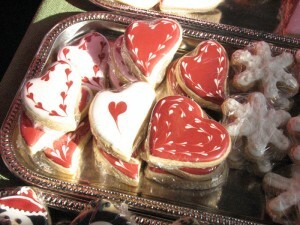 As much as we love them ourselves, dogs are no longer allowed at the market due to health and safety concerns. We’re asking everyone to please respect the market’s policy – don’t bring your pets to market! That great sunshine on Saturday is the type of weather that makes you want to play in the dirt. We’re talking gardening. And we’re inviting your kids to play in the dirt and learn a little something about their food and the environment. 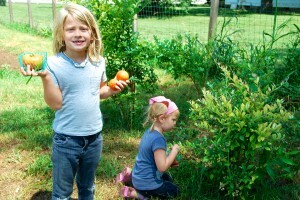 The class schedule for our Growing Kids Educational Garden is now posted on the Kids section of our website. Classes begin in April and are designed for kids from pre-k to 3rd grade. And the classes are free! 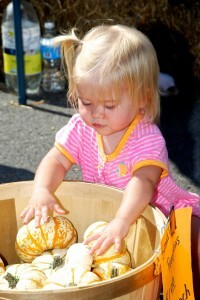 It’s a great way for your kids to learn where their food really comes from, with hands-on fun in the garden. 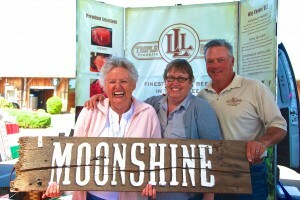 Click here to get details and sign up for classes. Learn to Grow – Grow to Learn! 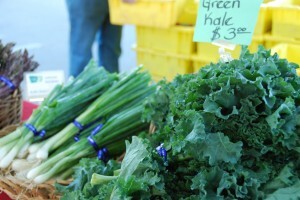 This entry was posted in Market Saturday News and tagged asparagus, baked goods, broccoli, carrots, Farm Fresh Food, farmers, Franklin Farmers Market, fresh food, Fresh Lettuce, herbs, local farms, snow peas, soups, spring crops, spring vegetables, sweet potatoes on March 17, 2014 . Never mind that one week ago, we had snow and ice on the ground. 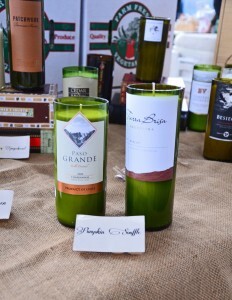 Saturday, it was sunshine and pleasant temperatures at the market. 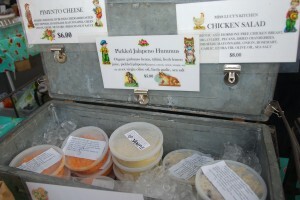 We even spotted a few folks dressed in t-shirts and shorts happily strolling around the market. 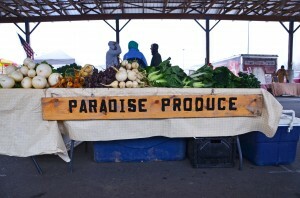 It was a good day to grab great fresh food. 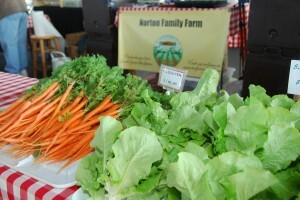 Colorful carrots, apples and squash were plentiful, along with tender fresh lettuce. 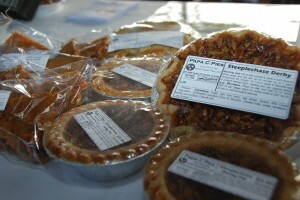 Lots of dairy goods and sweet treats too, such as cookies, pies and muffins were being snatched up and not all of it was making it out of the market. 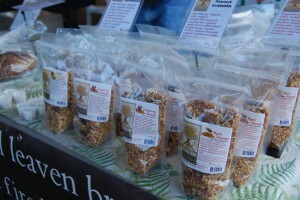 We spied some of you happily munching away while you walked around. 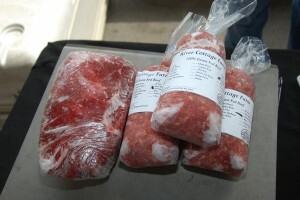 And what is it about sunshine and warmer temperatures that make us want to fire up the grill? 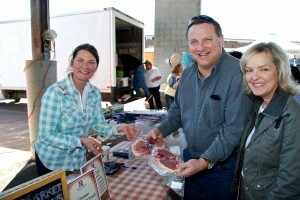 There seemed to be quite a few of you walking out of the market with steaks or hamburger to grill out. The official first day of spring is just 10 days away and we’re ready for the greening of trees and lawns, along with the beauty of spring flowers. 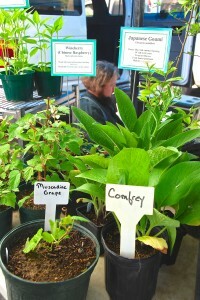 Everybody got a little tease of spring at the market, with early blooming plants with bright flowers. 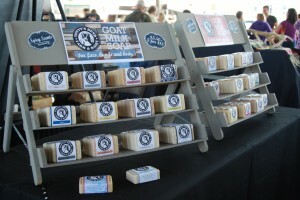 All in all, we have to say it really was the perfect sunny day at the market! With warmer temperatures and sunshine comes the urge to start digging in the dirt. You know what we’re talking about. 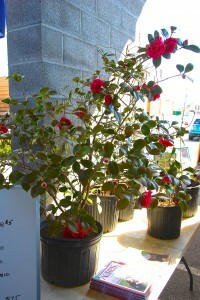 It’s time to get gardens in shape and start growing. And while gardens can take a lot of work, it’s a great place for kids to learn a lot. 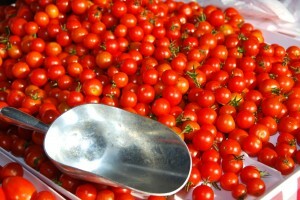 Things like where food really comes from or why ladybugs are super heroes in a garden. 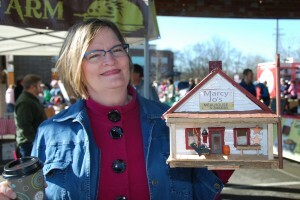 With classes like the Poop Pot Project and Doing the Worm Wiggle, kids can learn a lot in the market’s Growing Kids Educational Garden this spring. 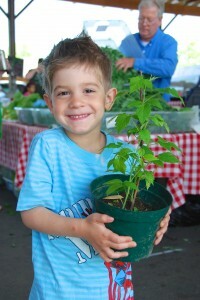 It’s a fun, hands-on way to learn about the environment, nutrition and how things grow. The free classes at the garden begin on April 22nd and are designed for kids pre-k through 3rd grade. Registration for April and May classes begins today. 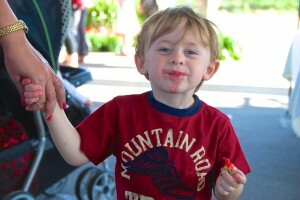 Get more info about the Growing Kids garden and download registration forms by clicking here. Learn to Grow – Grow to Learn! 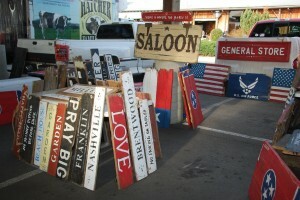 Want to see more pictures from this past Saturday’s market? Just click here. 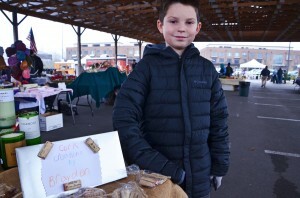 This entry was posted in Market Saturday News and tagged apples, carrots, cookies, dairy goods, Farmers Market, flowers, fresh food, Fresh Lettuce, grill, Growing Kids Educational Garden, ladybugs, Muffins, pies, plants, squash, sweet treats on March 10, 2014 . 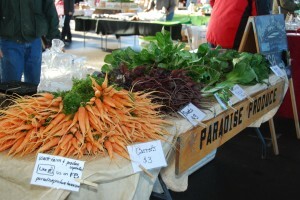 It all adds up – sunshine plus good fresh farm food equals happy people. 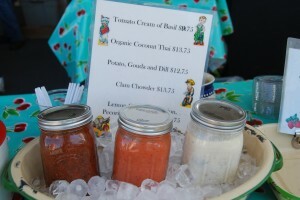 For proof of that theory, all you needed to do was come to the farmers market this past Saturday. Everyone was in a good mood. 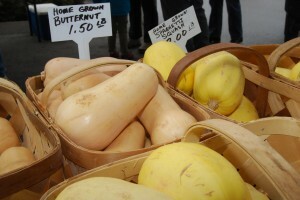 There were plenty of yummy fresh veggies, such as beets and squash. 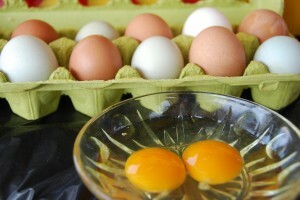 Maple syrup was another favorite and everyone was looking for those blue eggs. And there were big smiles all over the place. 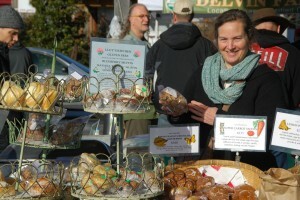 Of course, eating sweet doughnuts or munching on muffins while roaming the market played a role in keeping those smiles coming, but we think the bright sunshine and warm temperatures were a big part of it too. 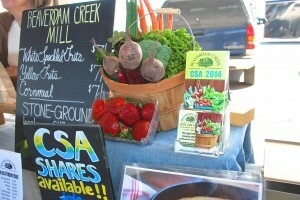 Beaverdam Creek Farm CSA program is in full swing! 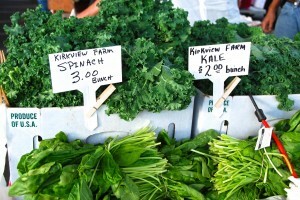 During the day, someone asked us about three little letters that are popping up now in the farm booths all over the market. 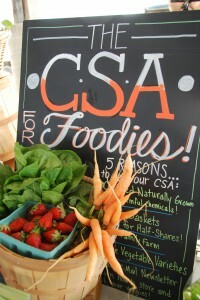 Those three letters are C-S-A, which is the nickname for community supported agriculture. 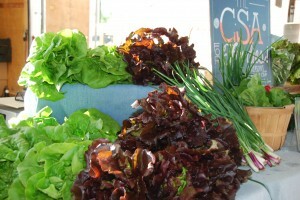 A CSA gives you a weekly share of whatever the farm has harvested all through the growing season and now is the time to sign up for a CSA. 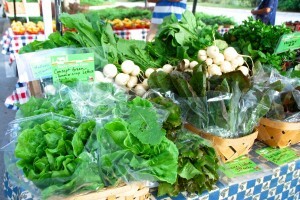 Many of the farmers at the market, such as Delvin Farms, Beaverdam Creek Farm and West Wind Farms have CSA programs. 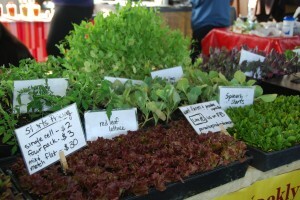 Next time you’re at the market, ask your favorite farmer if a CSA is available to get the best in fresh food straight from their farm every week. 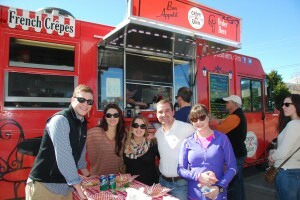 And finally, we welcomed a new member to the market family last Saturday. 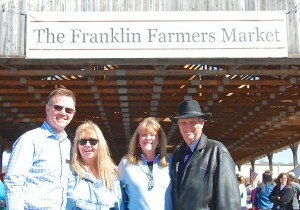 We’re happy to announce that Ford Lincoln of Franklin is a sponsor of the Franklin Farmers Market. 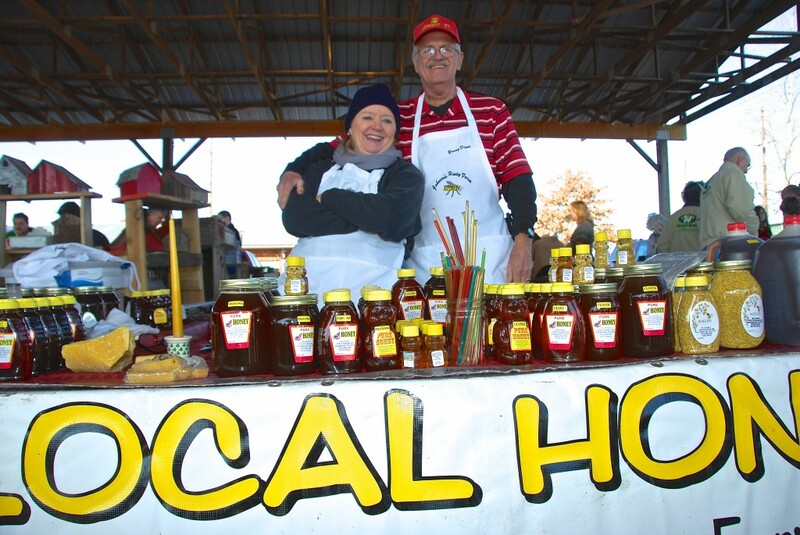 The market is a 501 c 5 non-profit agricultural organization and with sponsors such as Ford Lincoln of Franklin, we are able to help local farms to keep growing. Our thanks to Ford Lincoln of Franklin for their support – Welcome to the FFM family! 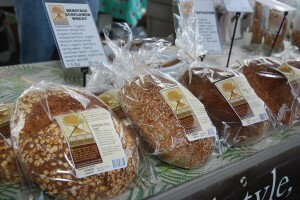 You can visit pictures from Saturday’s market by clicking here. 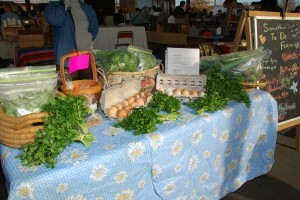 This entry was posted in Market Saturday News and tagged Beaverdam Creek Farm, beets, blue eggs, CSA, CSA Programs, Delvin Farms, Doughnuts, Farmers Market, FFM, Ford-Lincoln of Franklin, Fresh Farm Food, fresh food, fresh veggies, maple syrup, Muffins, squash, West Wind Farms on February 24, 2014 . 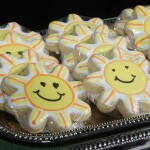 We were blessed with warm Sunshine on Saturday! 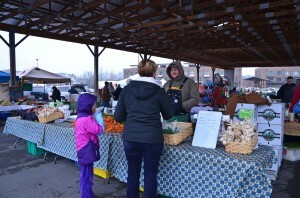 After a month of bone-chilling winter weather, suddenly everything changed for the farmers market. Sunshine and a high in the mid-60’s on the first day of February! 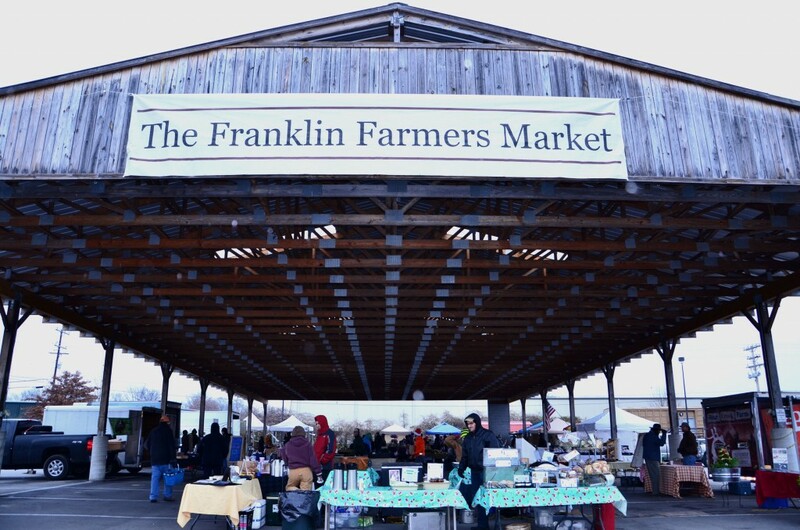 Weird but wonderful weather for the month that’s typically the coldest of the year and it made it a great day to be at the Franklin Farmers Market. 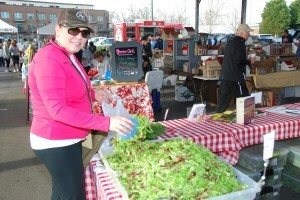 Lots of folks came out to get the best in fresh food and to soak up the sunshine with the farmers and vendors at the market. We saw lots of crunchy carrots and yummy apples from Kirkview Farm being snatched up and delicious sweet treats from the Norton Family Farm too. 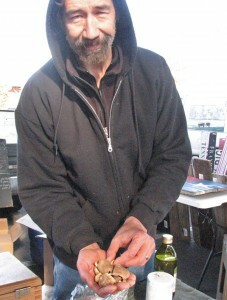 Those dried shitake mushrooms from Gardner Grove Farm were a hit. 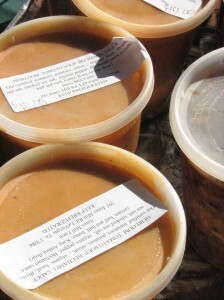 So were the Heirloom Tomato soup from Jones Mill Farm and the Potato Gouda Dill soup from Lucy’s Kitchen. 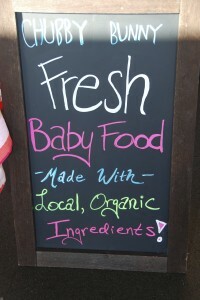 Even the little ones got a taste of extra-special yummy food to take home with the fresh organic baby food from Chubby Bunny. 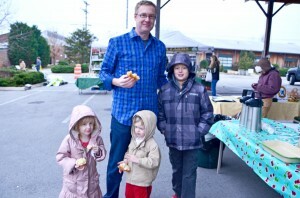 And despite their recent status as TV stars, the Biscuit Love crew was at the market too. They were featured in a recent segment on NBC’s Today show called “Marketing Makeover” that helps worthy small companies to keep growing and thriving. 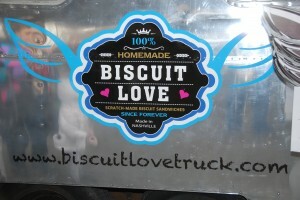 The thing we like best about the Biscuit Love Truck is that they use local and seasonal ingredients from such farms as Beaverdam Creek, Bloomsbury Farm and Bear Creek. 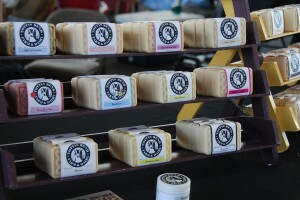 We don’t think they were giving out autographs this past Saturday at the market, but they were serving up scratch made biscuit sandwiches like the East Nasty, with buttermilk fried chicken, cheddar cheese and sausage gravy. 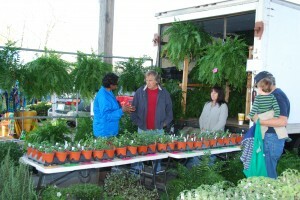 And finally, there were a lot of parents on Saturday asking about gardens. 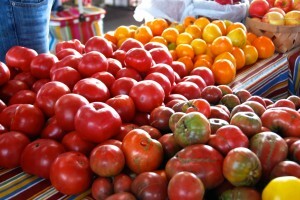 When will tomatoes be back in season? 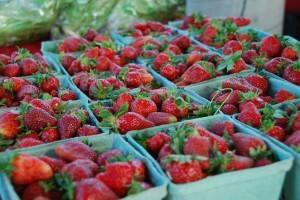 When will strawberries be available? What about green beans? 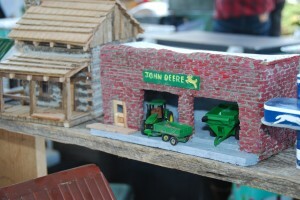 The farmers do have all the answers for you, but then so could your kids. How? 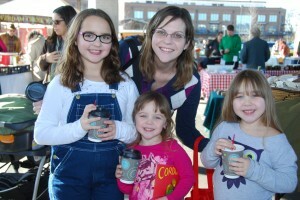 By being a part of the FFM’s Growing Kids Educational Garden classes. It’s all about teaching kids about where their food really comes from and what it takes to get it from the garden patch to the table. 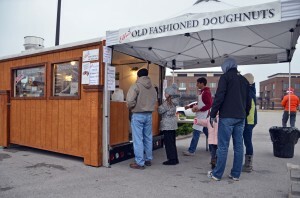 There are lots of new features this year’s program, which gets underway in April. 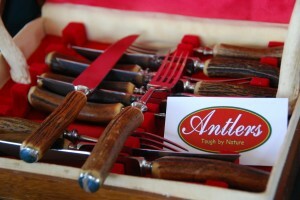 Details on classes and how to sign up will be released at the end of February in the market’s newsletter and website. 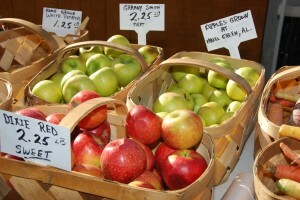 This entry was posted in Market Saturday News and tagged apples, Beaverdam Creek, Biscuit Love, Bloomsbury Farm, carrots, Chubby Bunny, Educational Garden, farmers, Farmers Market, Franklin Farmers Market, fresh food, Gardner Grove, Jones Mill Farm, Kirkview Farm, Lucy's Kitchen, NBC's Today Show, Potato Gouda Dill Soup, tomatoes on February 3, 2014 . 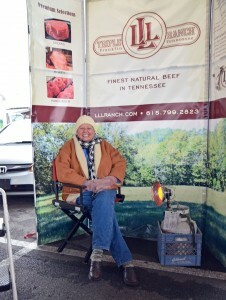 Sunshine brings out Tennesseans for Winter Farm Fresh Foods! 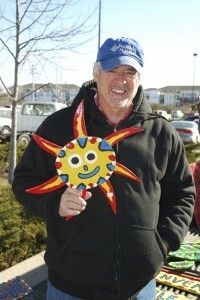 Sunshine brought happy smiles from everyone at the market on Saturday! 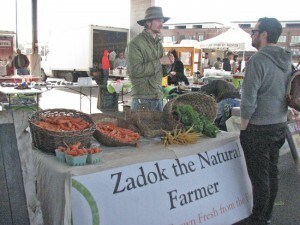 Sunshine, smiling faces and the best in farm fresh foods from local farms – there’s not a better way to start the day and that’s what type of day it was at the market this past Saturday. What a difference a week can make! No more nasty polar vortex weather to deal with and that brought lots of happy people out the FFM. 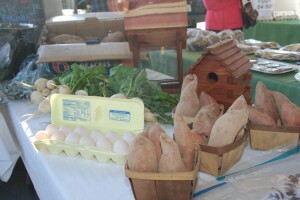 Quite a few of our farmers sold out of their fresh winter produce. 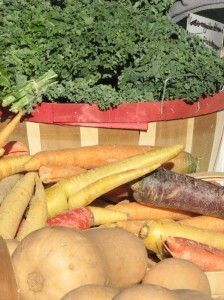 Brussels sprouts and cabbage, colorful carrots and potatoes were going home with smiling customers as well as baskets of fresh apples. 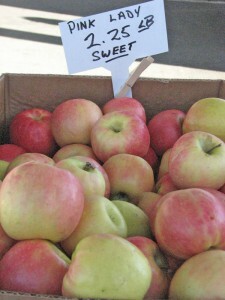 Kirkview Farm still has crisp sweet apples! 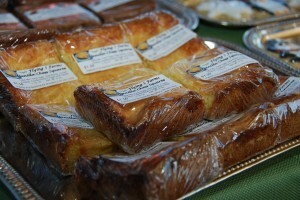 Fresh baked goods, grits, eggs, pecans and tender local beef, pork and chicken – it was all at the market Saturday. 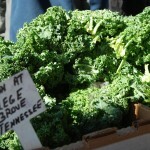 And we spotted some of you taking home fresh green kale for salads or maybe to make that crazy good kale fudge pops recipe we told you about last week. Speaking of recipes, some of you have been asking about the market’s Eating in Season cookbook and where you can get a copy of it. 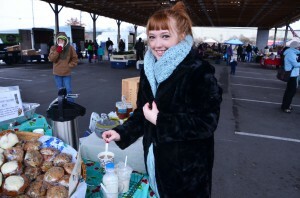 The cookbook booth is on winter break, but you can still pick up a copy of Eating in Season at the market. 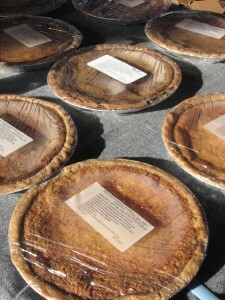 You’ll find the cookbooks at the Norton Family Farm booth. 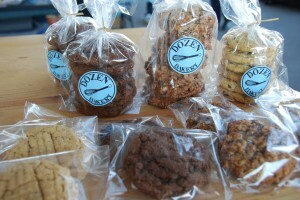 And while you are there, pick up some of the Norton’s famous fresh lettuce or delicious baked goods, like Karen Norton’s fantastic biscotti – perfect with a fresh cup of coffee! And finally, we also spotted quite a few of you stopping by to ask the folks at Triple L Ranch about the name of their new four-legged family member. But they don’t know, because voting for the calf’s name isn’t over with yet. This Saturday, January 18th the polls will close, so you need to get your vote in now and pick the name for the little fellow. Should he be named Bartholomew or is Jasper a better name? What about Ollie or Buttermilk? You make the choice. Vote now! 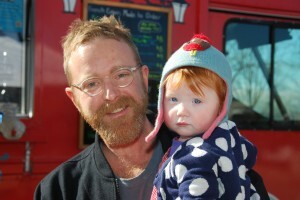 We’re just happy to be at the market! 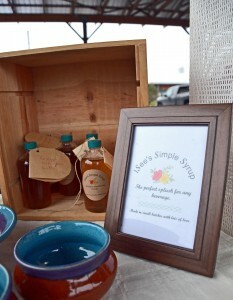 Nothing sweeter than local honey from Johnson’s Honey Farm. 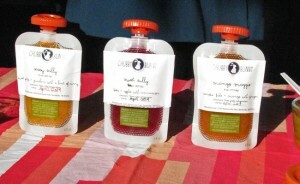 Great for hot winter drinks! 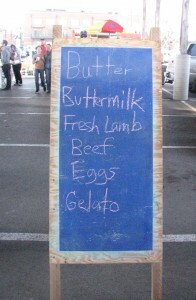 This entry was posted in Market Saturday News and tagged best local farms, biscotti, Brussels sprouts, cabbage, carrots, Chicken, Coffee, cookbook, eggs, Farm Fresh Foods, farmers, Franklin Farmers Market, fresh apples, fresh baked goods, fresh food, fresh produce, fresh winter produce, grits, kale fudge pops, local beef, local farms, Meats, Norton Family Farm, pecans, pork, potatoes, Tennessee, Triple L Ranch, winter produce on January 13, 2014 . 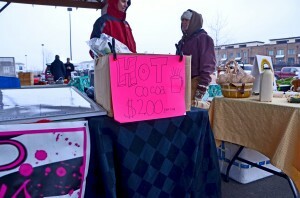 It was cold, wet and a little icy on Saturday. 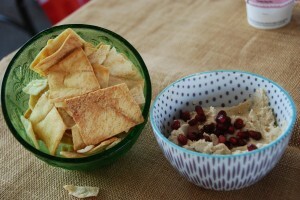 Enough to make everyone want to stay home and sip a steaming mug of coffee or hot chocolate. 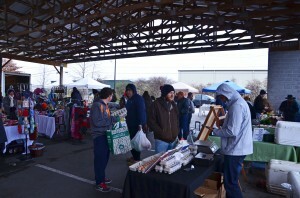 Yet several of the farmers and vendors at the Franklin Farmers Market defied the cold weather and showed up for you. 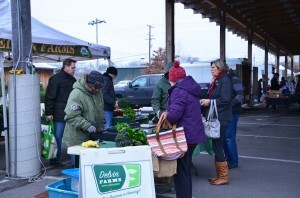 And many of you stepped out into the cold to make it to the market too. 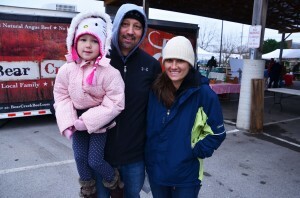 Our hats are off to everyone for braving the chilly temps and coming out to the market. 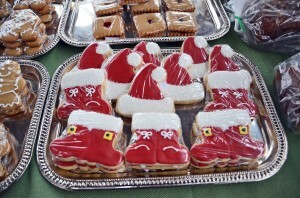 It might have surprised you to hear that the ice cold weather kept Santa from visiting the market. 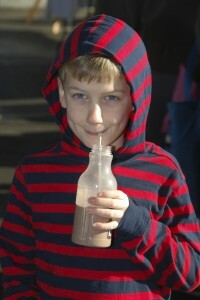 Of course, chilly weather doesn’t bother him, but it can cause problems for other folks. 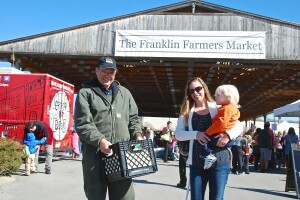 Santa wanted to make sure that all the children around Franklin could come visit him, so he decided to reschedule his visit to the market. So tell the kids to be on their best behavior this week and get their wish lists ready. 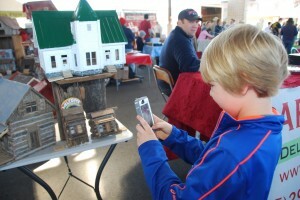 Santa will be at the market this Saturday, December 14th! 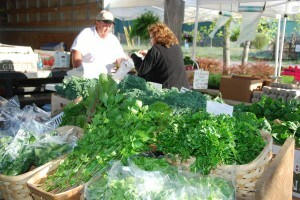 Whether its summer or winter, picking up good fresh food from local farms is what everyone does at the market. But there were quite a few of you doing something else this past Saturday. 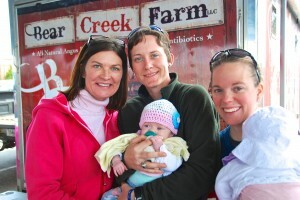 People were stopping at the Triple L Ranch booth to suggest names for a little calf born on the farm not too long ago. His mom abandoned him after birth and it was a little touch and go at first. Steven of the Triple L Ranch needs help with a name for this new bottle fed calf, do you have a name? Calves need to nurse very soon after they are born to get necessary antibodies and nutrients for their immune system. So this little calf was bottle-fed the right formula for newborn calves and now he’s doing just fine. But he’s still a bottle-baby and he’s become a four-legged member of the Lee family at Triple L Ranch and he needs a name. What do you think it should be? Tell us and if your name is picked as the right one, you’ll win a day on Triple L Ranch with the calf and a market goody basket. 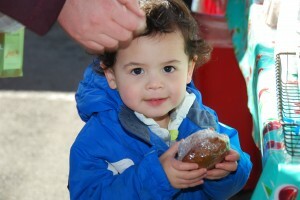 Just email lisa@franklinfarmersmarket.com and tell us what you think his name should be! 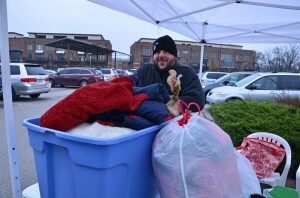 Thank you customers for donating so many winter coats and blankets! And finally, the frosty weather on market day made the “Love Will Keep Us Warm” blanket and coat drives all the more relevant. Financial hardships such as losing a job can make something as simple as buying an extra blanket or a new coat hard to do. Your donations of winter clothing, blankets and coats as you came to the market were beyond generous. Because of your compassion, many of those in need will stay warm through the winter. 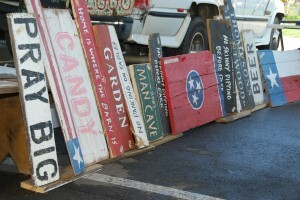 We believe its proof that we have some of the kindest people in Tennessee visiting the market. Our heartfelt thanks to everyone for sharing the warmth this holiday season. You can view more pictures of the day by clicking here. 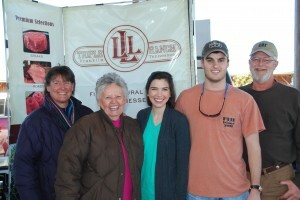 This entry was posted in Market Saturday News and tagged bottle-fed, calf, calves, Franklin Farmers Market, fresh food, local farmers, local farms, market, Tennessee, Triple L Ranch on December 9, 2013 .